UAL Awarding body caught up with Natasha Parker-Edwards, winner of the Level 4 Foundation Origins award, 2016. How did you find out about Origins? I was told about Origins by my Art Tutor Rob French on the Foundation course. He suggested to a few of us that we should apply. Tell us about the piece of work that you exhibited at Origins? My work throughout FAD responded to the theme ‘manipulation’, I was interested in exploring female sexual health and the ‘taboo’ associated with this. This led me to investigate the more sensitive issue of Female Genital Mutilation. I wanted to highlight that FGM happens on our doorstep in Western society and isn’t so far removed from England as people may think. The piece I submitted for Origins was my Final Major Project outcome. 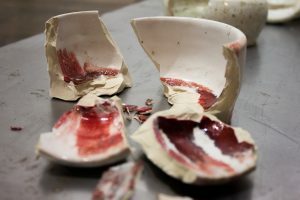 It was a triptych, two sculptures – one of which was interactive – made from ceramics, glass, and steel with a supporting handbound book of prints, photography and text. It aimed to raise awareness of Female Genital Mutilation and the consequences of it by using entropy and seriality as visual tools to reflect ideas of body manipulation. What did you find most enjoyable about exhibiting your work at Origins? The Foundation had given me the tools to create a piece which appeared refined and ‘gallery worthy’. I was excited to see other peoples work from around the country. I enjoyed setting up the end of year exhibition in college which involved plinth making, hanging and curating our work. It was following this that I was selected for the Menier exhibition. This was an exciting experience as it allowed me to set up and curate my work within another environment which made me have to consider a new space/restrictions etc. What was your experience of exhibiting your work at Origins 2016? I really enjoyed seeing my work displayed in a more professional manner. I was able to talk to students from UAL courses around the country and see all different types of work which had been made across the UK. It was also beneficial as a photographer took some photos of my work in the space, which was really useful for my portfolio. Tell us the most rewarding thing about presenting your work at Origins 2016. I was lucky enough to be awarded the Level 4 Art Foundation Origins Award by Bob and Roberta Smith at the award ceremony on the opening night of the exhibition. It was rewarding knowing the award had been given to me as they felt my piece had ‘the most impact’. This is something that I was hoping my piece would have as it aimed to raise awareness of Female Genital Mutilation in an approachable, sensitive and informative manner. Knowing it had been recognised and picked for the exhibition was incredible and it was made an even better experience being awarded the prize and hearing an established artist talk about my work. Having won the award, I was asked to do a 30 minute presentation at the 2017 UAL Awarding Body Annual Conference in London about my work and my experience of the Art Foundation as well as what I hope to do in the future. This was part of the same conference that Grayson Perry was speaking at. It was very nerve wracking but such an amazing experience to have been given. It is something I am proud to talk about to employers when discussing my work and experiences and I now feel less daunted by public speaking and talking about my practice which has also been beneficial at university. What would you say to students that are unsure about submitting work to this year’s event? Go ahead! You have nothing to lose, and so much to gain if your work gets accepted for the exhibition. What are you currently working on at the moment and where? I am currently at Bath Spa University studying BA (hons) Creative Arts: Art and Dance. As a dancer and artist, I am passionate about cross art collaboration and how this can foster original, exciting outcomes. As part of my current art research project, I am collaborating with KT Yun a local glassblower. To explore ‘collision of the arts’ plus the collision of humanity and nature and the consequences that Western society has on the environment. I am creating a film and some photography which merges contemporary dance and glassblowing experimentation through the use of projection and video editing. With my current dance focus on contemporary improvisation and somatic movement techniques as well as site specific performance art and Physical Theatre. I regularly work with postgraduate students, taking part in improvisation, gaga and site specific art workshops. I most recently participated in a two day ‘New Paths to Creativity: Somatic Movement Workshop’ exploring somatic improvisation, under the guidance of Karen Smith, an experienced and seasoned facilitator of this work. I was able to immerse myself into a world of movement exploration and creativity, learning how to release old habitual patterns and tensions and build confidence and originality in my own art and dance practice. Furthermore, in February I choreographed and performed in a site specific piece at the Holburne museum, named ‘Dolly Mixtures’, which gave fresh interpretation to the museum exhibits in close collaboration with composers. It involved audience interaction and chance methods to decide particular movement, scores and locations in the venue. I am performing in Bath Fringe this year in a contemporary dance/ physical theatre piece called ‘Remember to Smile’ based on desire, happiness and superficial utopia utilising the work of George Orwell’s novel ‘1984’. I enjoy improvisation and experimentation, finding it a way of fostering unusual, relevant and exciting moments. I feel as though my experience of the Art Foundation really helped expand my ability to reach out to other artists and discuss my own work to help produce collaboration projects across the arts. What are your educational and professional hopes for the future? Currently, being interested in many areas of the creative world, I am fairly unsure. I know I want to work and study in Bristol, Glasgow or London (or perhaps Berlin). I am hoping to go on to study at postgraduate level once graduating from Bath Spa University. I am currently interested in the UAL Art and Science masters course. Or I may look into Art and/or dance psychotherapy courses. Professionally, I hope to be able to practice as an artist/ dancer and continue my collaboration with other creatives alongside perhaps becoming a university lecturer or psychotherapist. But my hopes for the future change regularly!